Interested in Choral Training for young singers? Click here for details about our Preparatory Chorus. 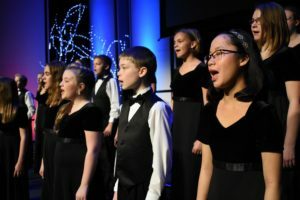 The Peoria Area Civic Chorale Youth Chorus was founded in 1986 to enrich the lives of musically talented children in grades four through eight. 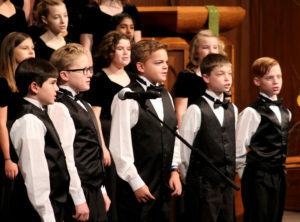 In addition to its guest appearances with the Chorale during each concert series, the Youth Chorus has appeared in concert with the Des Moines Children’s Chorus, The Milwaukee Children’s Choir, the Central Illinois Youth Symphony, the Irving School Choir, the Peoria Symphony Orchestra, the Heartland Festival Orchestra, the GospelFest Singers, the Opera Illinois’ production of Hansel & Gretel in the role of the children’s chorus, and performed in the Peoria Ballet production of the Nutcracker. The Peoria Area Civic Chorale Youth Chorus is a not-for-profit organization sponsored by the Peoria Area Civic Chorale. Founded in 1986, the Peoria Area Civic Chorale Youth Chorus exists to provide interested singers with extra-ordinary choral music experiences via outstanding music education and excellence in performance. Through a curriculum that uses high quality repertoire from a wide variety of musical styles this program strives to develop vocal and musicianship skills in the youngsters who participate, providing them with opportunities to not only experience the joys of singing but to lead them to be expressive artists. Youth in 4-8th grade (unchanged voice) exhibiting strong vocal and musical skills and potential are encouraged to audition for membership into the Peoria Area Civic Chorale Youth Chorus. No musical training or experience is necessary. Auditions are held each May, August and January. Also, many opportunities exist for parents and families to be involved in the success of the PACCYC. The Peoria Area Civic Chorale Youth Chorus cannot operate successfully without the assistance of volunteers. We are seeking students in grades 4-8 with unchanged voices. Auditions for new members for the Peoria Area Civic Chorale Youth Chorus for the fall 2019 semester will be held Tuesday, May 14 and August 13, 2019 from 5:00 to 8:00 p.m at the First United Methodist Church’s Chapel, at the corner of Perry and Hamilton Streets, in downtown Peoria (or by appointment). Please contact the PACC office at 309-693-6725 or email paccyouthchorus@gmail.com for audition appointment times, questions or more details. Please arrive with a song prepared to sing. This can be a song of the student’s choice – a simple hymn, such as “Amazing Grace” — just something that allows the director to hear the voice in a song the person knows well. Some time during the audition will also be used to sing some vocal exercises to check for range and voice quality. Rehearsals: Tuesday evenings from 4:30-6:00 p.m. starting August 20. A non-refundable Tuition is required for participation in the PACC Youth Chorus. Please make checks out to Peoria Area Civic Chorale, with the child’s name listed on the check. $150 per student/per semester if you have one child in Youth Chorus and choose to pay Fall semester tuition in August and Spring Semester tuition in January. $135 per student/per semester if you have more than one child from the same family in Youth Chorus and choose to pay Fall Semester tuition in August and Spring Semester tuition in January. $250 per student/per year if you have more than one child from the same family in Youth Chorus and pay full year tuition for all of your children in August. The Tuition Plus program is a way for parents and students to extend the opportunity of singing in the PACC Youth Chorus to all talented children, not just those who can afford it. Please consider making a donation to this program. The Peoria Area Civic Chorale Youth Chorus meets for rehearsals at First United Methodist Church, 116 NE Perry, downtown Peoria, on Tuesday afternoons, 4:30-6:00 p.m., from September to May. In addition to various community events, the Youth Chorus presents two concert events a year in October and April. They will also join the Peoria Area Civic Chorale in concert for An American Family Christmas December 13-15 and for their spring concert May 8-9 at Five Points Washington. Students will perform in uniform attire for all community, Youth Chorus and PACC Performances. Boys will have the option of renting or purchasing black tux pants, white shirts and black vests/bow ties. Girls will wear Youth Chorus performance attire (black pants and white blouses). Previously worn outfits may be available at a reduced price. Treats are provided for the students each Tuesday afternoon before rehearsal. Parents are asked to sign-up for a rehearsal to bring treats. We ask that treats are available for the students by 4:15 in order to begin rehearsal in a timely manner. Please be sure that the treats you choose possess nutritional value. Treats that are high in sugar adversely affect the rehearsal atmosphere. Also, one parent a week is needed to volunteer as rehearsal monitor. The rehearsal monitor will help with crowd control before rehearsals, monitor student breaks and handle any non-music concerns that may arise during the course of rehearsals. Beth Rock is from Bartlett, Illinois and received her Bachelor of Music Degree from Eastern Illinois University and graduate level training from Vandercook College of Music. Her teaching career has included schools in the Chicago area as well as Central Illinois where she also serves as a clinician and adjudicator. Mrs. Rock was a conductor at EIU music camps for five years and is currently the Assistant Director of the Eureka College Summer Music Camp. She has been listed in Who’s Who Among America’s Teachers, The National Honor Roll for Outstanding Teachers and Who’s Who among America’s Women. Mrs. Rock was honored at the Governor’s Mansion in Springfield where she accepted the Illinois Alliance Music Educator’s Award, which is part of the Kennedy Center Honors. Mrs. Rock will begin her tenure as Director and Artistic Director of the Youth Chorus in Fall 2016. 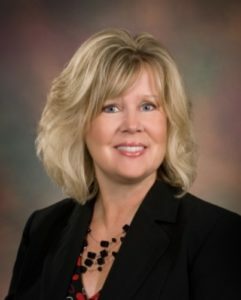 Debra Rude currently teaches vocal music in the Peoria Public Schools. A native of Peoria, she holds a Bachelor of Music Education degree from Illinois Wesleyan University and a Master of Music Education from Illinois State University. 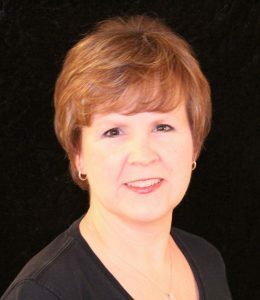 She has served as music director and accompanist for many community theatre productions and is the pianist for Fellowship Bible Church in Peoria. Since 2010, Debra has volunteered with Legends Drum and Bugle Corps as part of the food crew for rehearsal camps and summer tour. She and her husband Dennis reside in Metamora. For further information, please contact our business office.